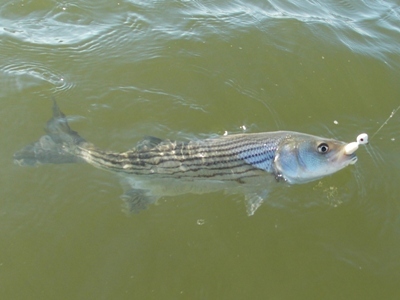 The Chesapeake Bay forage species include bay anchovies, striped anchovies, silversides, mullet, Atlantic Menhaden, mummichogs, killifish, and others. Members of the drum and croaker family are among the most common saltwater fish of the Chesapeake Bay. This group of fish includes red drum, black drum, croaker, spot, kingfish, gray sea trout, and speckled trout. Other familiar species include summer flounder, bluefish, and Spanish mackerel. Some areas of the Chesapeake Bay sustain populations of reef dwelling fish, including black sea bass, tautog, spadefish, gray triggerfish, and sheepshead. These species are found near oyster reefs, mussel beds, wrecks and other structure. Several species of fish commonly found in the Chesapeake Bay are anadromous; they spend most of their life at sea, before migrating through the bay and into rivers or shallow areas to spawn. The striped bass, also known as “rockfish” is the most well known anadromous fish found in the Chesapeake Bay. The major nursery for Atlantic striped bass stocks is the Chesapeake Bay. Young fish feed and grow in shallow estuaries until they are large enough to leave the bay. As adults, they live along the coast from New England to the Carolinas. White perch are small but tenacious fish that are common in parts of the bay and its rivers. The fish are caught with small baits such as grass shrimp or bloodworms, or by casting artificial lures or flies. They are sometimes found together with yellow perch. Yellow perch are found in several of the estuary’s rivers. Normally a freshwater species, these pan-sized fish tolerate brackish rivers of the Chesapeake Bay watershed. The American shad is another famous anadromous species that visits the Chesapeake Bay watershed. The species is also known as white shad, Atlantic shad or “poor man’s salmon.” They are sometimes found with hickory shad which are similar in appearance. Hickory shad are smaller than American shad. Another identifying feature of this species is its lower jaw which juts out further than the upper jaw. Hickory shad are silver with amber highlights. They have spots on the shoulder which are duskier and more obscure than American shad. Similar to shad, river herring are seasonal visitors to the Chesapeake Bay. The term “river herring” is a collective name for 2 similar species of anadromous fish; alewife (Alosa pseudoharengus) and blueback herring (Alosa aestivalis). The Atlantic sturgeon is the largest fish native to the Chesapeake Bay. Adult sturgeon can reach lengths of six to eight feet and weigh 200 pounds or more. In Canada, individuals up to 14 feet long and 800 pounds have been recorded. Atlantic sturgeon can live 60 years or more.